Gazpacho is and always has been one my favorite dishes of summer. When I was growing up, my mom and I would buy cans upon cans of Pepperidge Farm's gazpacho, chop up a bevy of fresh vegetables and keep a big jug of the fresh summer soup in the fridge. Every time I opened the door to our refrigerator, I was tempted with its promise of cool refreshing flavor and crunchy vegetables. Today I make my own gazpacho base and am always interested in new ideas for getting the gazpacho started. While flipping through Heart of the Artichoke by David Tanis, I came upon a genius idea I wish I had come up with first. Tanis grates fresh tomatoes on a box grater and strains the seeds out of the tomato puree for pure, unadulterated fresh tomato gazpacho starter. What you do after that is really up to you. I used a microplane to grate garlic and onion into the base and then seasoned with salt and pepper. Chop up whatever fresh vegetables you have on hand and call it a day. I garnished this bowl with chopped jalapeno and olive oil. Check back on Thursday for directions on how to take the garnish up a notch with a vegetable salad encased in a ring of avocado. Rinse tomatoes and cut in half horizontally. 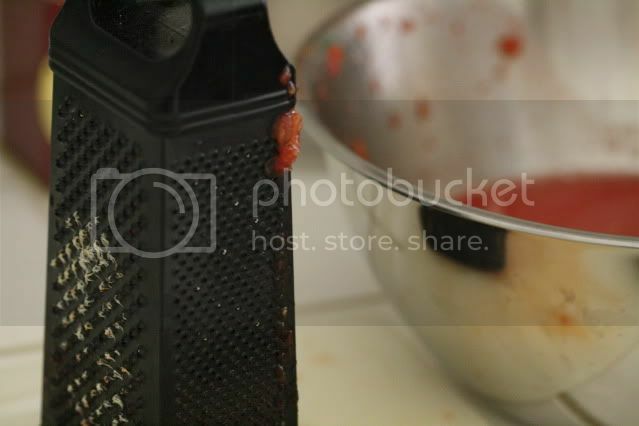 Grate the tomatoes on the large holes of a box grater until you are left with just the skin of the tomato. Toss the skin. Strain the tomato pulp through a coarse-mesh strainer to catch the seeds and any large pieces of pulp. Peel the garlic cloves and grate on a microplane directly into the tomato starter. Do the same with the onion. Season to taste with salt and pepper. Divide among six bowls and garnish with chopped jalapeno and a drizzle of olive oil. Love gazpacho too. 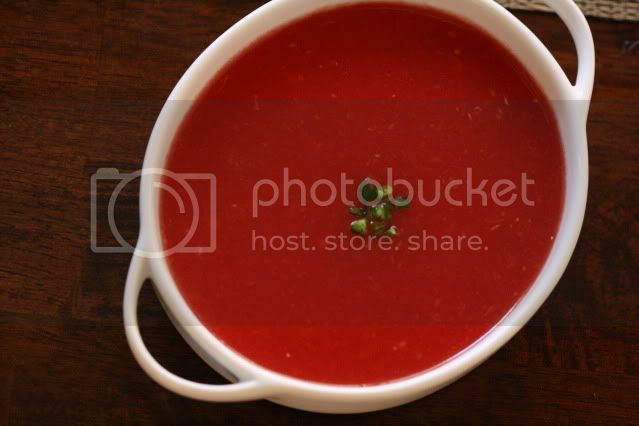 Every summer I prepare a roasted tomato gazpacho. Yours looks divine. Thanks for sharing. Beautiful! So great meeting you today! This looks so fresh and delicious. It screams healthy!